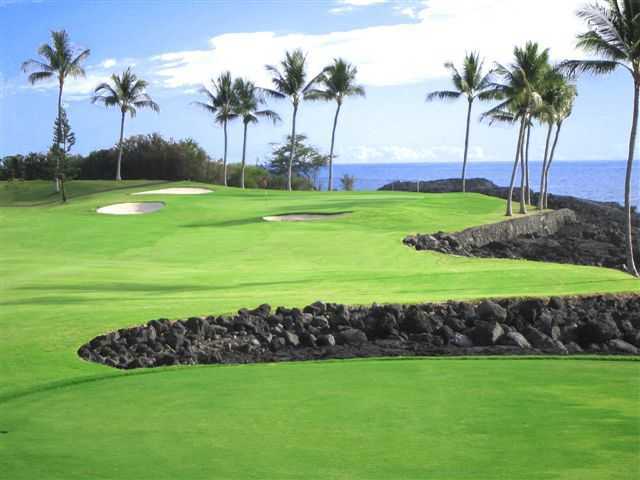 The Ocean Course is one of two championship courses at Kona Country Club. 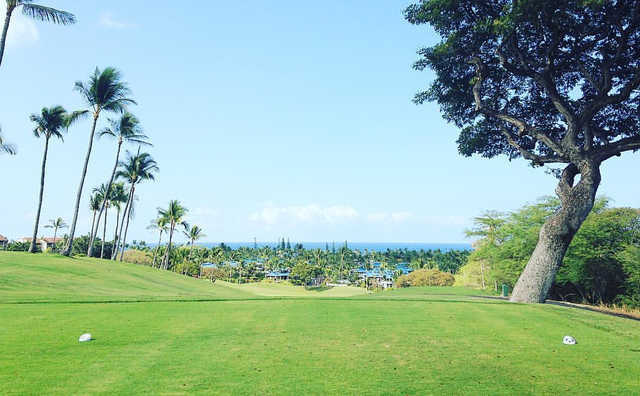 As its name implies, this course has an oceanfront location with views of the surrounding mountains that are home to its sister course, the Mountain Course. The Ocean Course is one of two championship courses at Kona Country Club. 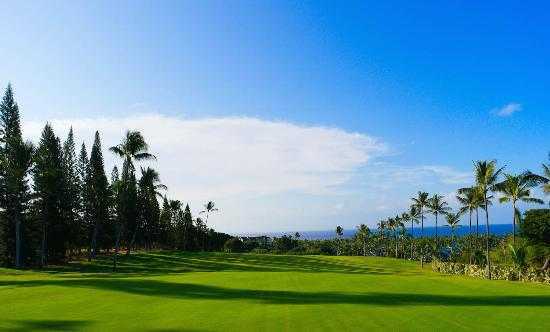 As its name implies, this course has an oceanfront location with views of the surrounding mountains that are home to its sister course, the Mountain Course. The Ocean Course provides an easier, but no less enjoyable round than its sibling. The layout features wide-open fairways and numerous strategically placed sand bunkers. The turquoise waters and black lava outcroppings provide natural hazards. 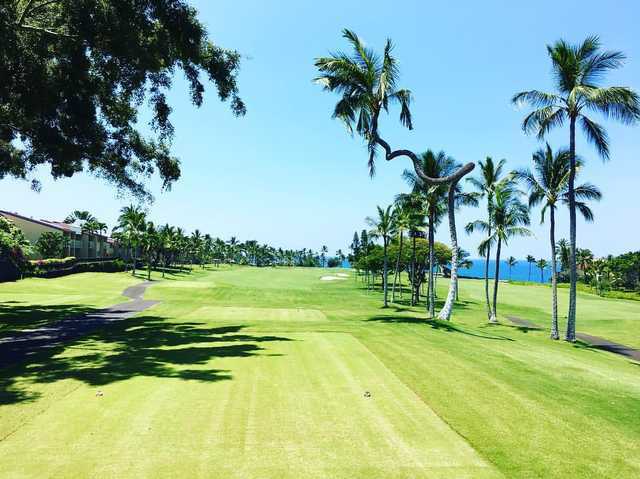 The signature holes are the third and 12th, but one of the most memorable is the 13th hole where during November through March, you can catch a glimpse of a humpback whale. While both Kona C.C. golf courses provide a variety of challenges, the Ocean Course is a gentle, more player-friendly option that still features the same stunning views as the Mountain Course. Played this on 10/6/2016. Course layout was superb but conditions were a bit dry and patchy on the fairways and greens. You pay for the views on this course. This course was closed when we were there in January 2016. We were told it has been closed for a few years, they were still mowing.The mountain course is nothing but weeds. They are renovating it, but it seems to take forever to get the work done. Nobody seems to know if and if so when it will re-open. We have played the Ocean course and Mountain course for 23 years this year when we brought our family they would not return emails to give us an offer and we went to the course with our clubs and weren't able to put together a deal for a number of playes ,we played else! Kona CC is really beautiful. I am there a couple of times a year, and always play the Ocean course. Check on aeration as it cuts green speed in half for a week. The club house has a great view of the bay. Food is so so. The Pro Shop staff have been really nice to deal with, The cary guys seem to space out on water and such from time to time. The course itself has big greens and is kept in first class shape. The back 9 features some nice fade holes along the water by a big blow hole. I have now played most of the big isle courses and Kona CC is up there with some of the best. The course was in good shape but we were very disappointed by the lack of yardage marking. Nothing on the sprinkler heads. Fabulous course. Fairways were in great shape for the off season. Will return.